On what is International Day Of Happiness, we discuss why being happy now is actually the key to losing weight. 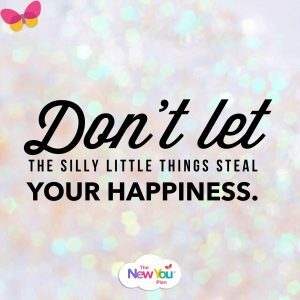 Rather than focusing on being happy when you get to your target, try it now and be amazed and how this positivity will help you succeed. How often do you hear yourself or other people say… “When I become”…. or “I will be happy when”? It is a common thing to hear…. The thing is, life does not really work that way. The most important thing you can do is BE HAPPY NOW. 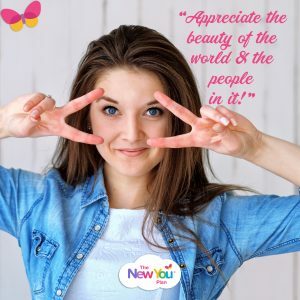 Happiness will fast track your weight loss journey, and make it more enjoyable and increase your chances of getting to your healthy target weight dramatically! SO BE HAPPY NOW! When you are on track with your most important goals, like losing weight, with this progress your brain will start to release dopamine, which is a great chemical of well being and happiness. That is why when you are making so much progress with your weight loss journey you feel so good! The problem is that a lot of people turn to food to make them feel happy. But to be successful on your weight loss journey and maintenance journey you need to find ways to be happy without turning to food. So what do you enjoy doing? What is it that makes you happy? How often do you do things that make you happy? Top tips to help you be happy now! While what makes each of us happy varies from person to person and we should do more of the things we love in order to make us happy, there are some simple steps you can easily incorporate into your daily life in order to increase your happiness. People who are the happiest spend the most time with others, and the least time alone. Spending time with positive people, who are supportive of your journey is the easiest way to stay happy. Comparing yourself against others can instantly bring us down. Judge yourself by your own measures and not other people’s standards. No matter what life throws at you, try to see the positive in every situation. Start your day with a positive affirmation and keep it in mind at all times. Being optimistic leads to action. 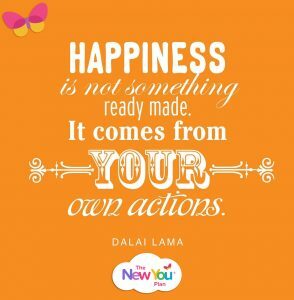 It’s not just what you believe or your outlook on life that contributes to happiness, take action! How good does it feel to give someone an unexpected gift? Being generous often brings us the most happiness so try to do a little everyday. The most simple of things, such as making someone a cup of tea can really make their day. Think about what you are good at. Showing off our talents are an easy way to increase happiness, so get out there and show the world what you’ve got! Appreciate the beauty of the world and the people in it! Build relationships and grow as a person. Adopt an attitude of gratitude and make the world that little bit happier to live in for both you and the people around you. Take your first step with The New You Plan today!